EVOLINE S3 GLOSS WHITE. 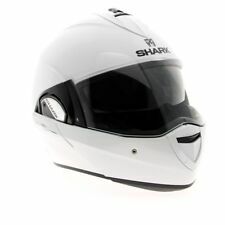 & virtually every motorcycle product currently available from our wide range of suppliers. S100 Cleaning Products, Silkolene Oil, Vance & Hines. MAIN DEALERS. Semi-automatic Auto-up system unlocking simultaneously visor and chin. - Integrated UV380 label & anti-scratch sun visor. - Quick release visor system. We also find quality bargains in previous years?. 1- 2.2-mm, Pinlock®-ready, ultra flexible visor. 3- Slim profile for limited clutter'. The Evoline Series 3 is Sharktooth Bluetooth ready which is very easy to fit! Shark Evoline Series 3. Technical Information for the Shark Evoline Series 3 ’’Auto-up’’ device for unlocking the visor and chin bar simultaniously. Shark Evoline Pro Carbon. It features an air pump system, which ensures a nice, snug fit; perfect for safety and for during colder periods, when you need to keep the cold air out.